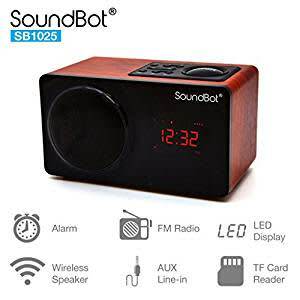 PREMIUM LARGE 76mm SPEAKER DRIVER Designed with audiophile experience in mind, this FM Radio Alarm Clock features large speaker cavity inside to reproduce excellent sound effect with 7w powerful output to deliver enhanced acoustic audio and music listening experiences. INTEGRATED FM RADIO TURNER - Equipped built-in tuner with simplified single click auto scan function to program and preset FM radio channel stations and allow navigation at ease. LARGE LED DISPLAY to blend in well with any contemporary environment, elegant atmosphere, or any other configurations. ALARM SNOOZE FUNCTION - Comes with an intuitive control large snooze button to allow quick navigation and easy access . Solid performance with fashionable dark wood finish, stylish design, and 3.5mm aux input port universal compatibility to go along with virtually any Android, iPhone, iPad, tablets, smartphones, iPods, MP3, MP4, and other Bluetooth enabled digital players or media devices with aux port.